Or so the art-school saying goes. Dutch designer Bauke Knottnerus does both. 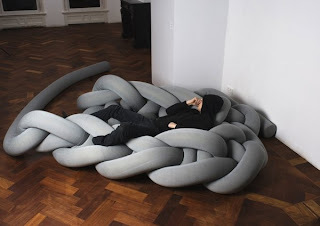 Built from a collection of giant foam-filled threads, his Phat Knits are woven into furniture-like items. Chunky rugs appear ripped from a swatch of a giant’s sweater, while his unconventional seatingnresembles noodles from that same giant’s dinner plate. take up to four people—and though it might sound like a joke-Knottnerus actually uses PVC needles up to 13 feet long and the same techniques one uses to weave garments. Acknowledging the influence of Pop Art and Surrealists such as Magritte on his work, Knottnerus admits he enjoys the reactions his humorous pieces elicit. I've done some knitting myself after reading a marvellous book about a wool shop in New York. I forgot the title...maybe I will remember that later. But anyway this knitting is something different! Love it.